Financing your college career can be just as, if not more, important as buying real estate or your first car. There are countless options in the financial markets today when it comes to student loans and so it’s critical that you compare lenders to find the best match. CommonBond and Laurel Road are two top lenders vying for your business but which one is best? CommonBond began when three students from the Wharton School of the University of Pennsylvania realized the burden of student loans firsthand and felt that paying for student debt shouldn’t be so cumbersome. The founders of CommonBond also believe in doing something good for the world, and that led them to create a partnership with Pencils of Promise, a non-profit that educates children in need with each loan issued. Undergraduate, graduate, MBA and parent PLUS loans are all supported by CommonBond. Regardless of where you are in your educational career, there’s likely a loan product that fits your needs at CommonBond. As one of the most popular choices, refinancing with CommonBond is a typical pathway for students holding federal loans. Refinancing rates are often lower for borrowers than their original interest rates, so the conversion makes financial sense. CommonBond doesn’t operate in all 50 states, however, so check your location before diving into the application process – most states are supported. Students who are in need of funds during their academic careers can also turn to CommonBond. Undergraduates and those pursuing higher degree programs can find private loans designed just for them. In most cases, you can borrow sufficient funds to pay off your school’s tuition. Remember that interest accrues while you’re in school. Paying some of the interest before graduating is a smart way to control your finances. Laurel Road is a lender that has a variety of funding options for students. Unlike many other lenders, Laurel Road supports students entering trade industries that only require an Associate’s degree. With Laurel Road, you have loan options whether you’re striving for a two- or four-year degree. Laurel Road has loans for a number of different purposes, including home buying. And it knows how to help borrowers manage money and make their school dreams come alive so the loan choices on offer are suited to the needs of students. If you have multiple loans from several years of schooling, the repayment process may be confusing because of the various accounts. You can simplify your debt with a refinanced loan whereby only one payment each month is made. Nearly every type of student loan, including those for graduates of two-year institutions, can be repackaged and topped with a competitive rate so it’s worth checking out whether you can save with a single refinance. In-school loans are available for undergraduate and graduate programs. The minimum amount that can be funded is $5,000. Based on the school’s tuition rate, the loans can equal the amount it takes to get you to graduation. Most loans have a standard payback amount with no forgiveness or graduated-payment options. The trade-off with these missing features is a competitive interest rate. The good news is that student lenders battle fiercely for your business. That translates into competitive rates from both lenders. 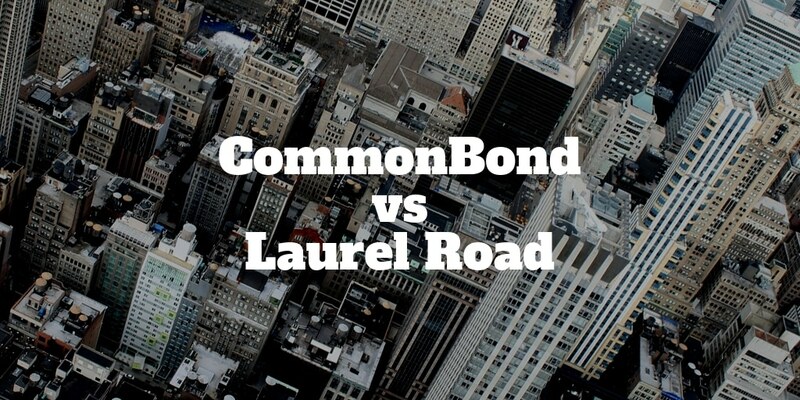 Here’s how Laurel Road vs CommonBond rates stack up. A big selling point when you choose CommonBond is the availability of hybrid loans. The way hybrid loans work is that for half of the loan’s life span, you enjoy a fixed rate. After the midway point, it converts into a variable rate. Only CommonBond offers hybrid loans as a refinancing choice. Many lenders are pulling away from traditional fees structures and are instead now fitting them into the interest-rate structure. Nevertheless, some fees still apply. Laurel Road prides itself on having no origination fees. This fact makes them an attractive choice in a sea of loan products. In contrast, CommonBond requires a 2% origination fee on their in-school loans. There are no fees when refinancing. CommonBond is transparent about its fees, so be sure to clarify the total interest cost when applying. The days of prepayment penalties are gone for the most part. Neither CommonBond nor Laurel Road will charge you for paying off your loan early. CommonBond provides a 10-day grace period for your payment to be received. For payments made after the grace period, you will incur a 5% late fee. A loan payment that’s 15 days late will incur a 5% late fee with Laurel Road. The charge can be as much as $28, so be aware of your payment amount and due date to avoid this scenario. Most consumers look solely at the interest rates when it comes to their student loans. It’s easy to overlook other key features. Here are unique features of CommonBond and Laurel Road that make them stand out in the marketplace. Doing business with CommonBond means that you’re doing something good for developing nations and their children. A percentage of CommonBond’s funds will go to Pencils of Promise, an outreach program that works in Ghana and other countries. With CommonBond, you can support a worthy cause while paying down your student loans. Laurel Road understands the value of good service. If you’re happy with your experience, you can refer a friend and possibly pocket some extra money. When the friend completes a refinancing loan with Laurel Road, you’ll receive $400. Referrals are one reason why Laurel Road can keep its rates and overall costs so competitive. Laurel Road offers repayment plans from 5 → 20 years. CommonBond gives its customers the same terms for its fixed and variable loans. There is however a strict 10-year term on CommonBond’s hybrid loan offering. With both lenders, you can pay interest while you’re in school or defer it completely until graduation. These loans don’t become due until you’re about six months out of school. Repayments on a refinanced loan starts immediately after funding with both CommonBond and Laurel Road. From credit scores to co-signer credibility, many factors are considered when finalizing a loan. To ease the application process, most lenders have similar requirements that protect them from default. These rules also protect borrowers from taking on more debt than they can handle. For CommonBond’s private student loans, the eligibility criteria are fairly straightforward. You must currently be enrolled in school at least half of the time and have a credit score of 670 or higher. Refinancing with CommonBond is a bit more difficult. Excellent credit scores above 750 are generally required. They also require that you have a salary in the six figures. With the exception of loan products for MBA students, every other loan with CommonBond requires a co-signer. Laurel is a bit more lenient when it comes to eligibility criteria. Refinancing student loans with Laurel Road simply requires proof of your graduation and current income level. In-school loans must be attributed to certain fields of study and qualified schools. The lender welcomes a variety of borrowers as long as they have the ability to comfortably pay back the debt. Start your application by selecting a product in which you’re interested. The available options include MBA loans and refinancing. Once you enter your details, the system offers you a rate range. CommonBond requires a co-signer to generate the rates, so be ready with this information from the start. The co-signer can be taken off the loan after a payment history is created. Visit the Laurel Road website and fill in your information. You can use the simple interface to log in and upload documents. Everything is managed through a secured online process. Laurel Road performs a soft check on your credit, and you’ll receive rates on various products afterward. You will receive an answer as soon as its credit department makes a decision. Both lenders have competitive rates, so choosing between them comes down to the details that best match your needs. Super prime borrowers with four-year degrees may benefit from CommonBond’s refinancing options, including its hybrid loan. Laurel Road takes on the students with loans originating from two-year programs and higher. Putting interest rate considerations aside, both lenders offer something unique to the students of the world. CommonBond includes a social good program with its work in Ghana, and Laurel Road focuses on providing lending options for all types of students. Consider your overall goals and whether CommonBond or Laurel Road financial products align with them before making your final decision.